Our island hopping trip begins in Greece's capital, Athens, before exploring the gleaming waterfront harbours, rocky coves and long sandy beaches of the Cyclades. Visit the islands of Syros, Paros, Santorini and Naxos by ferry. Paros - Chance to walk along an ancient Byzantine road and go snorkelling from Golden Beach. Arrive in Athens and check-in to our hotel. The city is a heady mix of ancient and modern, having been the capital of Greece for less than 200 years, but with a history dating back over 3,000 years. Located on the Plain of Attica, an area of amazingly varied scenery, from high mountains covered by pine forests to a stunningly beautiful coastline with a myriad of harbours. This evening you may choose to dine in one of the cafes in the colourful Psyrri district which offer traditional Greek cuisine of scrumptious aubergines, tomatoes and cheese washed down with ouzo or raki. There are great seafood restaurants near the harbour and traditional rustic tavernas in the well-known Plaka area at the foot of the Acropolis. This morning we take a walking tour of Plaka with our leader to soak up the atmosphere of the old town. You'll notice the contrast between the modern capital - the well-heeled inhabitants of Kolonaki on the one hand and the animated Plaka old quarter on the other. Along the way we'll see Syntagma Square and the Roman Agora. Every hour it's possible to see the changing of the guard at the Parliament building. Our walk will end at the Acropolis and you have the afternoon free. You might like to take a tour of the Acropolis and climb the winding path to the top of this sacred rock that has been used since Neolithic times. At the top you'll find the majestic ruins of the Athens of Pericles: the Propylaea (or marble entrance hall), the Parthenon (built by Ictinos 2,500 years ago), the Temple of Athena Nike (the Wingless Victory) and the monument most venerated by the ancient Athenians themselves - the Erechtheion. Tradition relates that the gods Athena and Poseidon quarrelled here; the sea-god struck the rock with his trident, causing salt water to gush out, while Athena hit it with her spear and brought forth an olive tree. As olives were deemed to be more useful, the other gods let her take the city under her protection. Alternatively you might choose to stroll around the shops or listen to bouzouki music in an outdoor cafe. For those that love to shop and like trying local food then the central market is a must with a huge variety of fruit, meat, fish and bread on sale amongst other things. Other attractions that you could visit include the Acropolis Museum, which is about 5-minutes\ walk from the main site, the National Archaeological Museum or the Olympic Stadium. You may like to walk up or take the funicular train to Likavitos which has great views across the city below. As well as exploring on foot you could purchase a 24-hour ticket for the local trams and public transport to help you cover as much ground as possible. This morning we drive from our hotel to Piraeus harbour where we board the ferry to Syros (which departs at around 7.30am and takes just under four hours). On the ferry we will have reserved seating, so we are assured of a seat, but you\ re also free to take in the view from the deck. We disembark at Ermoupouli Harbour and drive to our hotel in Galissas. Syros is the capital of the Cyclades and covers an area of about 56 square kilometres. This afternoon we will drive along the coast to Kini where we'll have the opportunity to purchase a picnic lunch or dine in a local tavernas. From here we'll take an easy coastal walk back to Galissas (covers approximately 4.7kms with 100m ascent and 100m descent and taking around two hours). This peaceful walk takes us through typical Mediterranean scenery with cypress and olive groves and great sea views. If you don't wish to join the walk then this afternoon is free for you to relax on the long beach near our hotel; with shallow waters it's an ideal spot for swimming. Alternatively you can explore the tranquil village of Galissas, which is set around a small harbour in a scenic agricultural area. Today is free for you to relax in Galissas or to explore more of the island. This morning you may like to join a coastal walk with our Explore Leader. Taking a public bus the short drive to Azolimnos where the walk begins. The walk takes around one and half hours to Vari (covering approximately 4kms). This walk gives you an excellent taste of the island's scenery. Once you arrive in Vari you can enjoy a swim, relax on the beach and have lunch in a nearby tavern before taking the public bus back to Galissas. This afternoon you may choose to join a bus tour of the island to see more of the fantastic surroundings. The island produces loukoumi, the Greek sweet that is similar to Turkish Delight and you'll have the chance on this excursion to visit a small factory and to purchase this local speciality. As part of our tour we'll take a walk to Ano Syros, which oozes medieval charm. Its long history can be seen its many cultural landmarks including its old castle gates that lead into the old town area. The town is built onto a hill with its tiered white and sand coloured buildings rising up to the Capuchin Church at the very top. Tonight there is the opportunity to join your Explore Leader for dinner in the islands capital, Ermoupolis. There's the opportunity to go on a further coastal walk this morning or to relax in Galissas. You may choose to walk from Posidonia to take in the great views from the lighthouse or to walk from Vari to Khroussa or from Agathopes to Mega Gialos. All are great options that allow you to see more of the islands scenery. Later this afternoon we drive to Ermoupoli, where you can store your main luggage at lockers at the port. You'll have free time to discover the island's capital and to have dinner before we board the ferry this evening to Paros. There is only one ferry between the islands that departs at around 9pm and the journey is approximately one and half hours. On arrival we'll transfer to our hotel in Drios and we'll arrive at our hotel at around midnight. Paros is one of the most attractive of all the Cycladic Islands. Its capital is Paroikia, on the west coast. Dominating the interior is Mount Profitis Ilias (770 metres) on the slopes of which are the famous marble quarries. Paros was the birthplace of the poet Archilochus, the inventor of Iambic verse. Among the many places of interest are the marble quarries, the picturesque fishing villages and a Venetian fortress. Especially interesting is the church, Ekatontapiliani Church of 100 Doors, about which a legend says that when the 100th door is discovered the Greeks will take back Constantinople (Istanbul). Today, you may choose to take a walk along one of the well preserved Byzantine roads that cross the island. This is an easy walk that takes around two hours. We'll use the public bus to reach the trailhead at the traditional mountain village of Lefkes. This is a very popular walk and the path is lined with wild herbs such as thyme, sage and oregano, so it's a sweet scented experience too. We'll finish our walk at Prodromos where there will be the chance to stop at a local cafe to enjoy homemade ice cream and baklava. Here in the side streets you'll usually find the locals playing a game chess or backgammon. From here we'll take the bus back to Drios or there may be the opportunity to stop in Piso Livadi for lunch or a further walk along the coast. Once back in Drios you can relax on the Golden Beach or you may like to join a cooking lesson of traditional Greek cuisine in the Hotel Anezina. Today is free to further explore Drios at your own pace or there is the opportunity to explore the islands coast from a different perspective by joining a full day boat trip aboard a traditional Greek caique. During the boat cruise there will be the opportunity to go swimming in the clear blue waters and also to have a barbecue lunch cooked by the crew. Alternatively, there is the option to discover the marine life of the area with local oceanographers who run diving and snorkelling trips from the Golden Beach. The snorkelling activities are suitable for beginners. Perhaps you'd prefer to take a local bus to nearby Naoussa or Parikia. Naoussa is a coastal, white village that's buildings practically glimmer in the sunshine. The area is famous for its wine and jam made in the surrounding vineyards which you can try in the village cafes. The Old Port area is the perfect spot to sample the cuisine and a glass of wine in a traditional tavernas by the harbour. It's in Parikia where you can visit the Church of 100 Doors and other historical places found here including the Byzantine site of Panagia Ekatontapyliani, an old Venetian fortress on the hilltop above the town, an 8th century BC waterfront cemetery and the Paros Archaeological Museum. This morning we drive to Parikia to catch the ferry to the island of Santorini. Our ferry normally departs just after midday, so we'll have a little time to look around Parikia before we board the boat. The ferry crossing takes around three hours and on arrival we will drive to our hotel in Karterados. Santorini (or Thira, as the island is also known) is the most southerly of the Cycladic Islands. It's one of the most picturesque areas in the Aegean and the familiar images of whitewashed churches with blue-domed roofs adorn this beautiful landscape. It's also an area of particular interest to those keen on the Lost Atlantis legend. Formerly a huge volcano, its centre disappeared in an enormous explosion in around 1450 BC and this area now forms a lagoon where some believe that the city of Atlantis now resides having been destroyed by the eruption and swept into the waters. Record show that the eruption did overwhelmed the Minoan settlements at Akrotiri as well as those on Crete. This evening you can choose to join a local wine tasting at the Avanti Estate in Messaria or another winery in the area. The island is best known for its delicious white wines. After the wine tasting you might like to go with your leader to Fira for dinner, before taking a local bus back to our hotel later this evening. Please note that our 6-Oct-19 departure stays at a hotel in Akrotiri instead of Karterados for the next three nights. This morning you have the opportunity to go on a coastal walk from our hotel to Fira and on to Oia. This is a moderate walk takes approximately four hours and covers eight kilometres. The path goes along the lip of a caldera and provides great views along the way out to sea and of the surrounding countryside. Halfway through the walk there's the option to stop at a coffee shop for refreshments. The village of Oia is built along a rocky stretch of coastline and is one of the most photogenic places on Santorini. It has a long seafaring culture and there are two types of houses here - cave houses that are dug into the volcanic rock in the cliff side and the captain houses above ground where the upper class ship owners once lived. Many of the churches here are also dedicated to sailors. After exploring Oia you can take a local bus back to Fira and then walk the short distance to our hotel (around 20mins). Whilst in Fira this afternoon you may like to visit the Museum of Ancient Thira, which explains the islands ancient heritage. From the halfway point of the walk it is possible to take a public bus back to Fira or to Oia to enjoy more free time in either place. Today is free for you to enjoy relaxing or exploring the island or you may like to join a cruise to an active volcano. During the boat trip to the volcano, for those who wish, there is the opportunity to take the dramatic path to the peak and to stand in the centre of the Caldera. The climb takes around one hour per way and the ascent is steep in places. There'll also be the chance to enjoy a swim in the sea to warm springs. The last stop on the cruise is the tiny island of Thirassia. You'll have a couple of hours to relax in the bay here with views of the volcano out to sea. There's time for lunch here or to climb up through the hillside village and walk around the surrounding vineyards. This morning there's the chance to take the local bus to Akrotiri and from the bus stop in the village it's just a short walk (one kilometre each way) to the ruins of the Minoan Bronze Age settlement. Akrotiri was covered by volcanic material when Thera Volcano erupted and this has preserved the buildings and household objects found here. Before returning to the hotel you might like to make a quick swimming stop at the nearby Red Beach. This afternoon at around 3pm we'll transfer the short distance from our hotel to the port and board the ferry to Naxos. The crossing takes around two hours and we disembark at Naxos harbour and walk to our hotel in Naxos Town, which takes about 30 minutes (our luggage will be transferred to our hotel from the port). The island of Naxos is the largest and some would argue the most beautiful of the Cyclades. The god Dionysus is believed to have lived on the island and taught the inhabitants to cultivate wine, which still has an excellent reputation today. Over the years, Naxos Islands interior is home to fertile and well-watered valleys and there are many places of interest on the island. Besides wine, the island also exports olive oil, corn, fruits of many kinds and marble which is comparable in quality to that of Paros. The town has plenty of character and in the Kastro, just above the town centre, is an area of pretty houses from a bygone era that are Venetian in style and marked with coats of arms. Today you may like to join a full day boat trip to Delos and Mykonos islands. 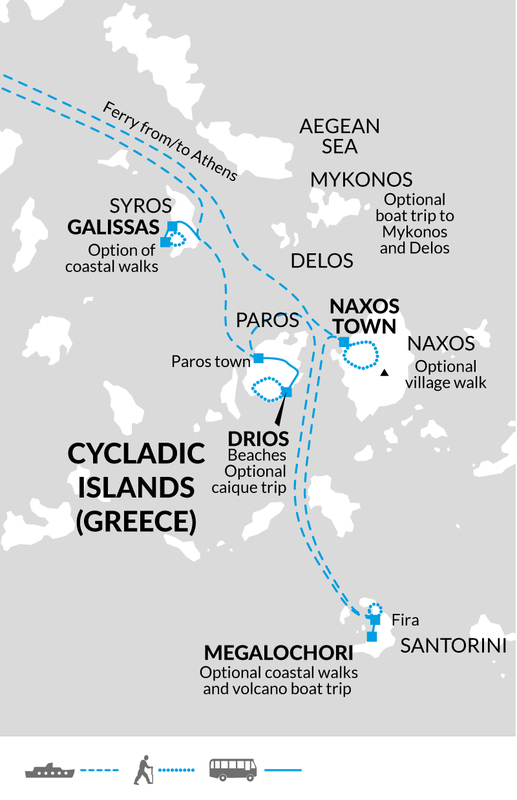 We depart first to Delos, which takes approximately one and half hours. Delos is an entire island covered with ancient ruins and amongst the highlights are the Temple of Apollo, Terrace of Lions, 3rd century BC theatre, ancient town and Mount Kynthos (113 metres). Following time here to explore we take the boat on to Mykonos (takes around 30 minutes). This island is frequented by the rich and famous. Whilst here you can explore its winding streets with its boutique and exclusive shops and another highlight are of course the windmills, which are one of the most photographed places in the Cyclades. We then return to Naxos by boat (takes around one and a half hours). Alternatively, you could choose to join a full day bus tour of Naxos Island, spend the day exploring Naxos Town or take a local bus to the surrounding villages. Today is free for you to explore or relax in Naxos Town or there's the option to take a taxi to Kinidaros, which is the starting point for the walk to Eggares. This easy walk will take us around two hours and covers approximately seven kilometres. This walk is different to many of the others we\ ve taken whilst in the Cyclades as it takes us inland. Kinidaros is located close to the mountainous centre of the island and is nestled into the rocky hillside that is surrounded by olive, plane and oak tress and the island's marble is quarried nearby. Eggares is a small farming village surrounded by fields and fertile farmland. There a number of pretty churches and also two restored olive presses, and whilst in Eggares you can visit the Olive Press Museum to learn about the process. This afternoon we take a taxi back to Naxos Town where the evening is free. This morning we walk to the port, which takes about 30 minutes and our luggage is transferred from the hotel. We board the ferry via Paros back to Athens on the mainland. On the ferry we will have reserved seating, so we are assured of a seat, but you\ re also free take in the view from the deck. The journey takes approximately five and a half hours and takes us through the Cyclades Islands to Piraeus Harbour. On arrival we'll transfer to our hotel to enjoy our last evening in Greece's lively and historic capital city. Our trip ends this morning at our hotel in Athens. On day two you may choose to visit the Acropolis and the entrance fee is €20.00. Combination ticket for the Acropolis and six other historical sites is €30.00. The Acropolis Museum entrance fee €5.00. National Archaeological Museum, entrance €10.00. Funicular railway to Likavitos €7.00 return. Trams and all public transport- 24 hour ticket costs €4.50. Tour of the island, €20.00 (minimum of eight passengers). If there are fewer than 8 passengers then a minimum payment of €160.00 needs to be split between those people who wish to participate. Full day caique boat tour with included barbecue lunch, €52.00 plus an additional €10.00 for the return transfers to and from the hotel. Minimum participation of four passengers is required. Volcano boat trip including stops at the warm springs and Thirassia Island. Price including transfers, dinner and sunset on board), €70.00 plus €2.50 entrance fee to the volcano. This boat trip starts at 2.15pm and returns after sunset. Alternative a Volcano boat trip that starts at 11am and returns at 6pm (excludes meals and transfers) is €37.00 plus €2.50 entrance fee to the volcano. Food is available to purchase during the boat trip and transfers can be done by public transport (local bus or taxi). Akrotiri ancient site, entrance fee €12.00 or €6.00 with photographic ID, if you're over the age of 65. Full day boat trip to Delos and Mykonos €45.00. Full day bus tour of Naxos Island €35.00. Transfers for the Kinidaros to Eggares walk - taxi to Kinidaros is approximately €8.00 per person and the taxi back from Eggares is approximately €5.00 per person. Local buses and taxis are used for the majority of the optional island walks and so you should allow €25.00 to €30.00 for this. July and August are the hottest months though the islands are freshened by cooling sea breezes, and so lightweight cotton clothing is ideal. Earlier or later in the season it's best to be prepared for drops in temperature and the odd shower, so we recommend wearing layers and taking a lightweight raincoat and an umbrella. A warm sweater will also help to fend off the unexpected chilling wind that on occasion races across the open deck of the ferries between the islands. Women wearing trousers or shorts are not permitted to enter monasteries, so please bring a skirt and ensure your shoulders are covered should you wish to visit any. Lightweight walking boots (especially for volcanoes as flip flops melt) or stout shoes with good ankle support for island walks and sandals or trainers for relaxing. One main piece of luggage and a day pack. You will have to carry your own luggage on and off ferries. Not many of the hotels used have lifts, and porters are not always available so don't overload yourself. We recommend taking a water bottle, sunhat, sunglasses, torch (in case of emergencies), sun cream and insect repellent with you. You may also find walking poles useful for our included and optional walks, as the terrain can be uneven underfoot. You should also bring swimwear and a towel. In Greece sink plugs aren't always provided in hotel rooms, so we would suggest bringing your own. Although entirely voluntary, tipping is a recognised part of life in this region of the world. Some local staff will look to members of the group for personal recognition of particular services provided. Please allow €10.00 per person for tipping. This island hopping trip is ideal for first time visitors to the Cyclades. Travelling by ferry and making use of the local buses is a great way to get around and allows us more flexibility. You have plenty of free time on each of the islands in order to give you the opportunity to do as much or as little as you like and our Explore Leader will happily make recommendations for how best to spend your free time and accompany you on a variety of walks. Walking is a great way to see the changing landscapes and discovering the characterful towns and villages.